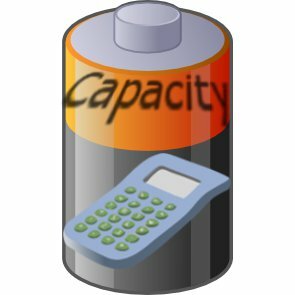 Summary: Calculate capacity of rechargeable batteries by converting Wh to mAh and mAh to Wh. Great for projects. Development went on a screeching halt after IR2 was released/ I am sorry. Things came up and got in the way. I am still thinking about how i Should continue this project. 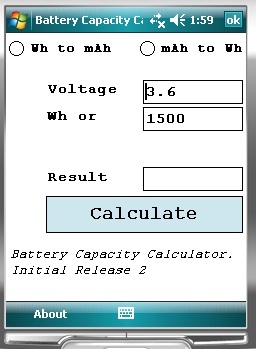 I am leaning more towards a Web App so that it can run on many devices. Any feedback just drop me a line. FaceBook - http://www.facebook.com/ericmorales115 Twitter - @ericmorales115 new site in the works also. 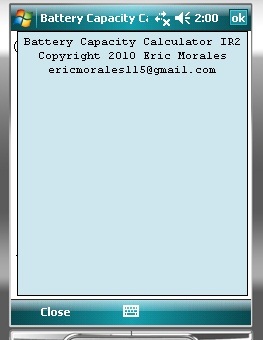 http://ericmorales.info thats in the works. works good, but the design is rather simple - perhaps more modern in a future version?